Somalia is one of 35 countries where Scouting exists but there is no National Scout Organization which is a member of the World Organization of the Scout Movement at the present time, and no organization was ever recognized by WOSM during the nation's periods of Scouting history. Scouting in Somalia appears to have existed until the 1990s, but due to the unrest in the country, no information on the situation on national level is currently available. In February 2007, UNICEF sources reported the existence of a local Scout group in Ceerigaabo, Somaliland. Though geographically part of the Africa Scout Region, even shown thus on the Region's emblem, Somalian Scouts are apparently participating in Arab Scout Region events on some occasions. Somalia and Somaliland issued some postage stamps with Scouting motives in 1999 and 2003, but it is not clear if they are connected to a specific organization. ↑ Nawaad Hassan (2007-02-22). "hellosomaliyouth.net: Newsdesk". UNICEF. 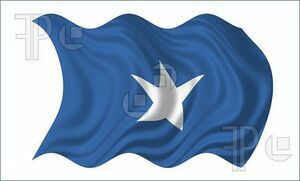 http://www.hellosomaliyouth.net/newsdesk.php?action=fullnews&showcomments=1&id=666. Retrieved 2007-03-15. ↑ "Scout and Guide Issues 1999". Scouts on Stamps Society International. http://www.sossi.org/articles/stamps99.htm. Retrieved 2007-03-15. ↑ "Scout and Guide Issues 2003". Scouts on Stamps Society International. http://www.sossi.org/articles/stamps03.htm. Retrieved 2007-03-15.